Snowpiercer is the most political film of 2014. And likely to be one of the most misunderstood. Snowpiercer is also very weird, which you’d probably expect from a South Korean sci-fi post-apocalyptic action film based on a French graphic novel that stars Chris Evans (Captain America) and Tilda Swinton (The Chronicles of Narnia). The basic plot of the movie is that in 2014, an experiment to counteract global warming (which is based on a real plan) causes an ice age that kills nearly all life on Earth. The only survivors are the inhabitants of the Snowpiercer, a massive super-luxury train, powered by a perpetual-motion engine, that travels on a globe-spanning track. A class system is installed, with the elites inhabiting the front of the train and the poor inhabiting the tail. When I say this is a “political” film I mean it in the Platonic sense of an ideal polis based on the best form of government that leads to the common good. Snowpiercer is an extended political fable about the polis, albeit one that includes scenes of hatchet fights between people carrying torches and people wearing night-vision goggles. 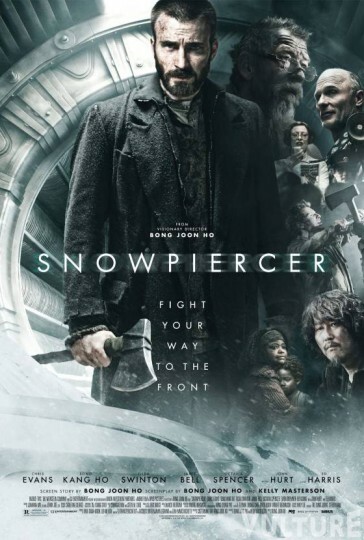 Snowpiercer was originally released in eight theaters in selected cities and on video-on-demand. Because of the rave critical reviews (it’s currently at 95% approval on Rotten Tomatoes), it’ went into wider release. If you haven’t seen it yet, lower your expectations. While visually interesting and, at times, thought-provoking, it doesn’t live up to the hype (director Bong Joon-ho’s 2006 monster flick The Host was similarly over-praised).You should also be forewarned that it’s rated R for violence, language, and drug content. If you have seen it and still wondering what exactly it was about, read on. Spoiler Alert: If you haven’t seen the movie yet and don’t like spoilers, stop reading now. Seriously. Massive spoilers below. Stop reading now. Don’t say your weren’t warned. The wrong way: As an Occupy Wall Street-style parable about economic inequality. The right way: As a parable of Darwinian economic and political determinism. Yes, Snowpiercer is about class warfare. And yes, it is about economic inequality. But it’s not the parable you may assume. For starters, there is a complete lack of both economic equality and social mobility because none exists in nature. “Curtis, everyone has their preordained position, and everyone is in their place except you,” says Wilford (Ed Harris). This train is a complete ecosystem which must respect the balance. Air, water, food, people. Everything must be regulated. For this, it was sometimes necessary use more radical solutions. Class warfare was the ingenious method of maintaining the population. The people in the front of the train can never grown too comfortable, for fear the back might rise up and take their place. And the down-and-out in the back are given just enough hope in a future regime-change that they don’t fall into complete despair. By having a controlled “revolution” every five years or so, the political manipulators (Wilford and Gilliam) could let the Front and Back kill off just enough people to maintain the balance. In essence, Wilford and Gilliam accept the validity of Darwinian social determinism, but believe it can be controlled and maintained more “humanely” by implementing a political solution (i.e., planned revolutions that cull the population). The wrong way: Seeing Curtis as the primary hero. The right way: Seeing Curtis as the secondary villain. In the beginning of the film, we identify with Curtis and assume he is the hero since he is championing the ideals the audience believes in, such as equality, fairness, and justice. But by the middle of the film we start getting a different impression of Curtis. Once he allows his loyal friend Edgar to die so that he can capture Minister Mason (Tilda Swinton), we realize he has too much of the True Revolutionary about him to be heroic. By the end of the movie we start to see him for what he really is: a man who will do almost anything—even eat human babies—in order to ensure his survival. After briefly considering the option, Curtis decides that maybe Namgoong Minsoo is right. Maybe it is better for humanity to discard their current polis and take a chance on a return to nature. The wrong way: Thinking Namgoong Minsoo provides a solution. The right way: Realizing that Namgoong Minsoo is as deluded as Curtis and Wilford. This seems reasonable enough until you realize that his “solution” is even more misguided and utopian than the alternatives. After Minsoo destroys and derails the train, only two kids survive. The movie ends with Minsoo’s drug-addled teen daughter and a 5-year-old boy from the back of the train staring at a polar bear. The idea of there being multiple generations of people on this train is a key one. There’s an expression in the film: “train baby.” Those are the two kids that survive, the ones that only knew life on the train. Someone like Curtis or Nam, they lived on Earth, then boarded the train. These kids have never known what it was like to step on the earth. So it’s almost like Neil Armstrong touching down on the Moon when they leave the train for the first time. They have no memory of what it’s like to be on the Earth. For them to procreate, it’s going to take a little time. So, for me, it’s a very hopeful ending. But of course there are so many deaths, and so many sacrifices … it’s not so sweet. But those two kids will spread the human race. Um, no. No they don’t. I’m a firm believer in authorial (or directorial) intent, but an ending has to fit with all that has come before. And there is simply no way that those two “train babies” could survive and “spread the human race” in a snow-covered barren wasteland. Nobody could. Bear Grylls, the greatest survivor on the planet, could live an extra day. Maybe. Those kids, however, would be eaten by that polar bear within five minutes. So the end of the movie is really about how one political ideal tried to trump another, while a third destroyed both. And then everyone was eaten by polar bears. Surprisingly, this makes for a very Christian ending. Snowpiercer is certainly not a “Christian” movie, but it could be considered Christian in the sense that it tells a parable that ends with a Christian truth: there can be no redemption without the Redeemer. The wrong way: Taking this South Korean sci-fi post-apocalyptic thriller too seriously by seeing Big Themes that aren’t really there. The right way: Not taking this South Korean sci-fi post-apocalyptic thriller too seriously but seeing Big Themes that are (if you look closely) really there. This strikes me as a bit unfair. We learn about his one-time desire to eat babies from a heart-wrenching story told by Curtis himself. He says the thing he hates about himself most is that he knows what people taste like. We learn that he was saved — as in he regained his soul — by seeing the self-sacrifice of Gilliam and others who literally chopped off their own limbs so that lives could be spared and the hungry might eat. Witnessing this act was quite clearly was transformative for Curtis. He was born again as a better man. Carter finds Christian themes in the film. This struck me as the most obvious. As for Gilliam, the most revealing thing he says in the whole film is that Curtis should cut out Wilfred’s tongue the moment he sees him. “Don’t give him a chance to talk to you.” (I’m quoting from memory). That advice implies — I think — that Gilliam is not quite the partner Wilfred thinks he is (and that Carter assumes he is). If Curtis followed Gilliam’s advice, Curtis would have never been clued into Wilfred’s ideological scheme. When I watched the movie, I missed that line about cutting out Wilfred’s tongue. If that’s true — and Wilfred was lying about their chummy relationship — that would indeed change some of my reading of the film. What say you, reader? Is Curtis a hero or a villain? This article was originally published by The Acton Institute, friends of ours.